Bodies are being removed from bus wreckage. 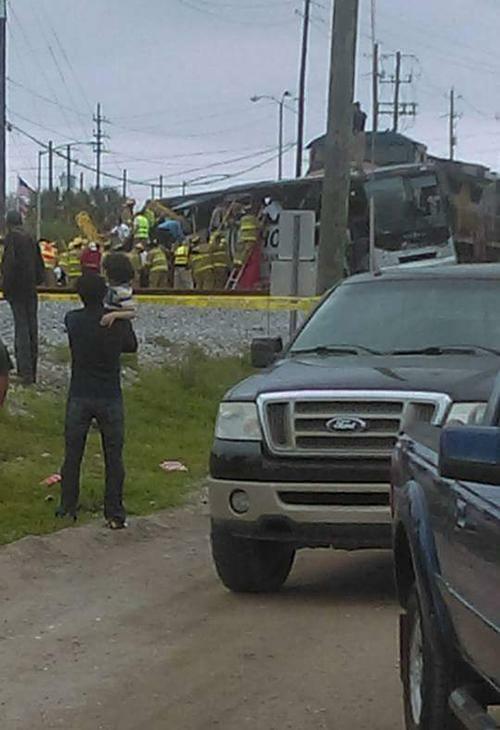 JACKSON, Mississippi -- The site of a train-tour bus crash that killed four people in Mississippi appears to have a troubling history of accidents, including two this year, a federal investigator said Wednesday. National Transportation Safety Board member Robert Sumwalt said the crossing in Biloxi has a hump that has caused tractor-trailers to bottom out in the past, and the federal agency is looking into whether the steep grade played a role in the crash Tuesday. The crossing has had 17 accidents involving vehicles and trains since 1976. "It sounds like a lot," Sumwalt noted, saying investigators would compare the crossing with other similar ones. Officials in Bastrop provide an update on Tuesday's fatal bus crash in Mississippi. On Tuesday, a charter bus carrying dozens of tourists to Mississippi casinos became stuck on the railroad tracks for about five minutes before a freight train barreled into it, sending frantic passengers in all directions, witnesses said. About 40 people were hurt, including seven critically. The cause of the crash is under investigation. Sumwalt said the agency's team would look into how long the bus was stuck, the history of the motor coach company and its driver, and whether or not the train's two-man crew could have done anything differently. 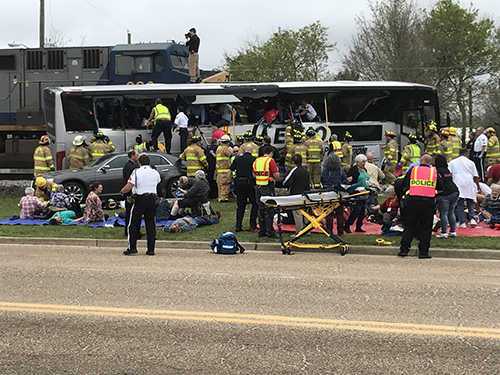 Some of the tourists from Texas were getting off the bus as the driver tried to move it, and at least one person was shoved underneath when the train hit, said Mark Robinson, a Biloxi native who saw the crash. The president of the senior citizens group from Bastrop describes the deadly bus crash. Body parts were "thrown everywhere," Robinson told WLOX-TV. Sumwalt said the train was traveling 26 mph when the crew put it into an emergency stop about 510 feet from the bus. 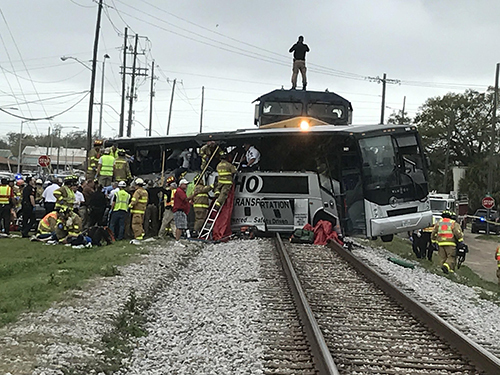 The train had slowed to 19 mph by the time of the crash and pushed the motor coach about 200 feet down the tracks before it came to a stop with the mangled bus still straddling the tracks. 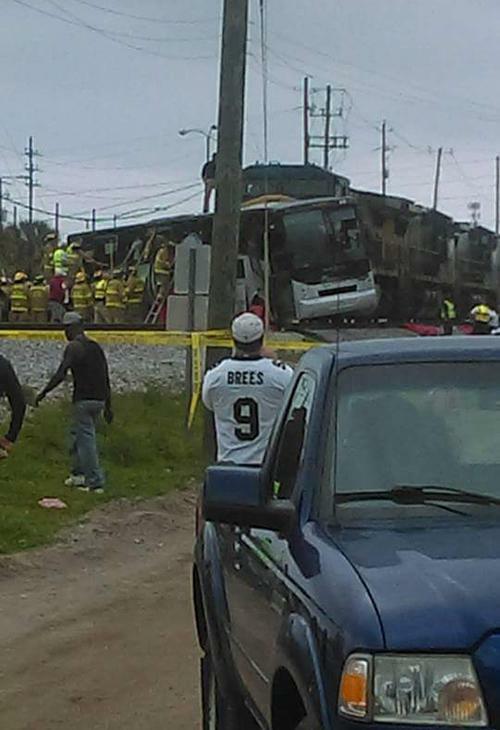 Authorities said it took more than an hour to get everyone aboard the bus out of the wreckage. Two people had to be removed with metal-cutting equipment. 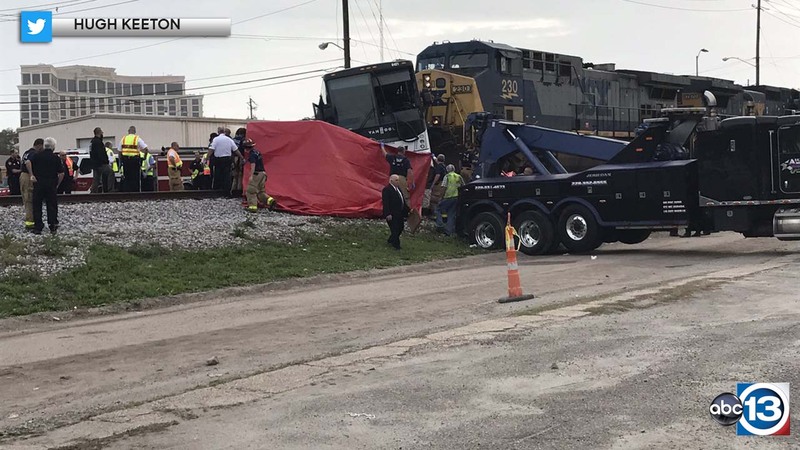 Mayor Andrew Gilich said several CSX railroad crossings through the city are dangerous, including the one where the accident happened Tuesday. He attended the NTSB news conference and said he had personally known people who had died at the crossing. He stressed that changes need to be made to prevent more accidents. Sumwalt said the crossing is the responsibility of both the city and railroad company. NTSB investigators are heading to Biloxi, MS following a deadly crash. CSX didn't immediately return an email for comment about the history of the crossing. The crossing has a sign warning drivers that it has a low-ground clearance, as well as a bell, lights and crossing arms. Federal Railroad Agency records show 10 trains a day typically use the track, with a maximum speed of 45 mph. There were accidents in 1983 and 2003 that involved one fatality each. In January, a Pepsi delivery driver's tractor-trailer became struck at the same crossing, the city said in a statement at the time. The driver bailed out and ran down the road to warn the engineer of an approaching freight train, but the train still plowed into the stranded semi and pushed it about 70 to 80 feet before stopping. No one was hurt. Police Chief John Miller said the Echo Transportation bus had come from Austin, Texas, carrying passengers to one of Biloxi's eight casinos. The weeklong trip started Sunday and was organized by a senior citizens' center in Bastrop, Texas, about 30 miles east of Austin. They were also supposed to visit New Orleans and then return home Saturday, according to a flier about the tour posted by Texas media. The names of the dead were not immediately released but a Texas school district confirmed that two former administrators with the district were killed. Ken and Peggy Hoffman were retired from the Lockhart school district south of Austin, according to Christina Courson, a district spokeswoman. Ken Hoffman worked for the district for decades and had served as an assistant superintendent. His wife was an elementary school principal, the spokeswoman said. The couple has a daughter and three grandchildren who now teach in the district. The train was headed from New Orleans to Mobile, Alabama, said CSX spokesman Gary Sease. He said the train crew was not injured. The single track is the CSX mainline along the Gulf Coast, passing through densely populated areas of southern Mississippi.